Physicists make a lot of statements about stuff they hope will happen, but might not happen in their lifetimes. One physicist, for example, thought that in certain cases, the incredibly common but hard-to-detect neutrino particles would somehow make entire atomic nuclei wiggle. He thought it a silly idea to even propose, given how difficult such a measurement would be to make. But forty years later, scientists are announcing that they’ve discovered that very thing. Specifically, scientists have found an all-new way to measure the “coherent neutrino-nucleus collision.” A physicist first predicted the possibility of these neutrino-interactions back in the seventies, and some think the discovery has nearly sci-fi implications for ways to use neutrinos in the future. Others were more measured in their take. But one thing’s for certain: Physicists think the results are exciting. “Wow!!!!! 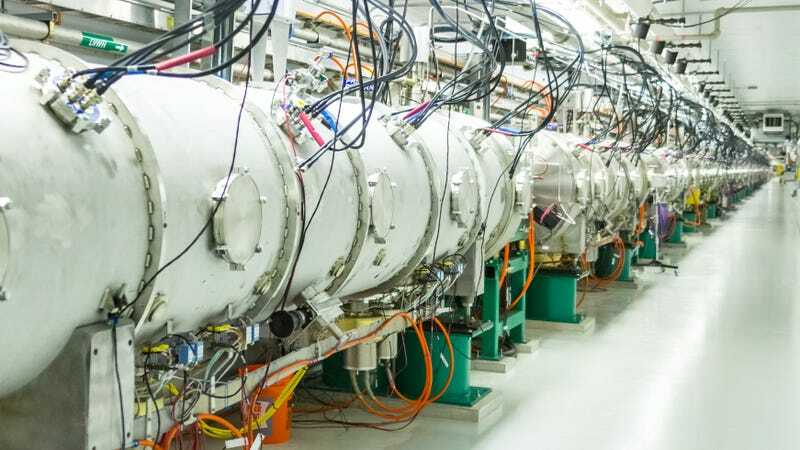 !” Physicist Juan Estrada at Fermilab in Illinois, who is also looking for this effect but wasn’t involved with the new study, told Gizmodo in an email. There are four ways particles can communicate with each other according to our laws of physics: gravity, electromagnetism, the strong nuclear force, and the weak nuclear force. Neutrinos are a special kind of particle that only interact with other particles via the weak nuclear force and gravity, both of which are incredibly difficult to detect with our labs on Earth. Neutrons, one of the two particles in atomic nuclei, can go through a weak force interaction called beta decay, where they spontaneously turn into protons, spitting out a neutrino and an electron. Today, the way physicists measure neutrinos is with a sort of reverse process. If a neutrino hits a proton, it might set off an inverse beta decay, turning the proton into an electron and a neutron—the electron then creates a flash of light that detectors can detect. But this interaction is rare, and requires huge vats of liquid to capture. Daniel Freedman, theoretical physicist emeritus from MIT, was the one who predicted a different kind of neutrino interaction back in a 1974 paper published in the journal Physical Review D. Rather than interacting with protons, he figured neutrinos can interact with entire atomic nuclei. This process would be low energy, since neutrinos could only produce the tiniest knock with their weak force, but it would also be far more common, since atomic nuclei are so much larger than protons. It would make for neutrino detection with a much smaller detector than 50 kilotons of water. But, Freedman wrote: “Our suggestion may be an act of hubris, because the inevitable constraints of interaction rate, resolution, and background pose grave experimental difficulties for elastic neutrino-nucleus scattering.” In other words, he thought the interaction would be far too weak and rare to capture. Forty years later, a team of physicists at Oak Ridge National Laboratory proved that Freedman was in fact right. “Well, it wasn’t impossible,” Juan Collar, physicist from the Kavli Institute for Cosmological Physics told Gizmodo. You can pretty clearly see the signal in the detector (black dots) increase when the beam is turned on, demonstrating that the team had measured the neutrino-nucleus interaction. Aside from proving a 40 year old theory, the experiment has already begun to set constraints on some proposed ideas for neutrino behavior, said Scholberg. Collar thought the most important application was the potential for a whole future of smaller neutrino experiments. “Maybe 50 years from now we’re going to have some neutrino technologies out there,” available for the public like the once high-tech lasers are today. Outside experts were all excited—other teams are currently looking for the same signal at other labs. “It is a great success in finding a unique process which everyone believed to exist but has been difficult to discern,” said John Gregory Learned, physicist at the University of Hawaii. He specifically tipped his hat to Collar, but did call for a little caution regarding future prospects—for now, he thought the applications would be quite limited.